Fast & Furious franchise stalwart Vin Diesel is taking on rumors about Fast and/or Furious 8’s directorial challenges by promising a final go at the franchise, in the form of a trilogy. 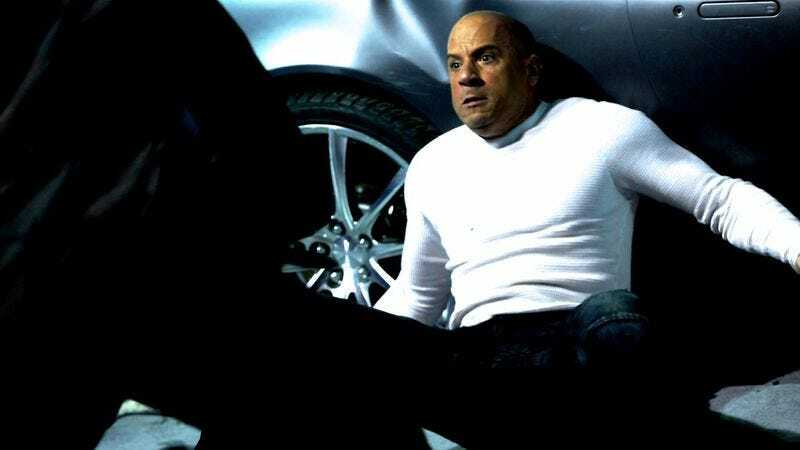 /Film is reporting on comments made by Diesel’s publicist, also known as Vin Diesel’s Facebook page, confirming that Furious’ byzantine plotting will require a three-film story arc for closure. Or, in the parlance of Peter Jackson, why make one blockbuster, when you can make three? But while you can overstuff perfection, Diesel reminds us that you can’t rush it. “My producing partner Neal would love for me to just sign off on a director, but this is too special a franchise,” Diesel posted on his Facebook page. “These matters have to be very carefully handled. To be clear, NO ONE has been offered to helm Fast 8 yet… let alone seen a script.” This statement contradicts earlier reports that previous helmers James Wan and Justin Lin had been offered the directing gig, with each demurring due to difficulties working with a hands-on Diesel. Of course, both are going on to other successful franchises, so these types of rumors are hard to confirm or deny. The /Film report also reminds us that Lucas Black’s (previously seen in Tokyo Drift) appearance in Furious 7 was part of a three-film deal. This of course dredges up the memory of a Fast & Furious movie built around Black instead of Diesel, which sounds downright apocryphal. Given the increasingly obscene amount of money generated by each successive entry in the franchise, you can count on Dom, Letty, Roman, Tej, and Hobbs to oil up their muscles, supercharge their V8s, and peel out for a final adventure. And then they’ll risk everything to do it another time. And then one more time after that for good measure, before finally calling it quits. Probably.